The epitome of glamorous in the world of Disney villains is Cruella DeVille, she maybe evil but she dresses well for creating mayhem. For this look the most important item to have is a fur coat, most preferably in white. The outfit is completed with a black gown, red gloves and shoes, and faux diamonds. The glam look for Cruella starts with her iconic white and black hair and finishes with a dark green smoky eye and a BOLD red lip. You can get the wig, gloves, shoes, and necklace by clicking on them, and below are a few options for coats and dresses. Reminder that thrift shops and apps like poshmark are also great resources for finding pieces like gowns at a less expensive price. 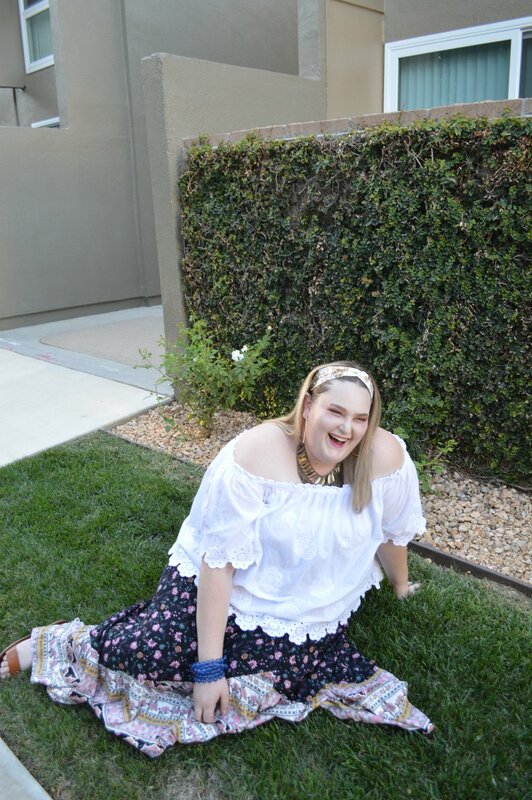 I remember as a kid my mother and grandmother had me dress up as a gypsy for the halloween carnival, so when I saw the opportunity to do it again this year, but with a glamorous twist, I jumped at it. Flowing skirts and loose fitting tops are a great option for a halloween party that is sure to have great food to binge on. Gypsy’s wear loads of bold and layered jewelry, I would suggest getting it from thrift shops, or even your mother’s closet. 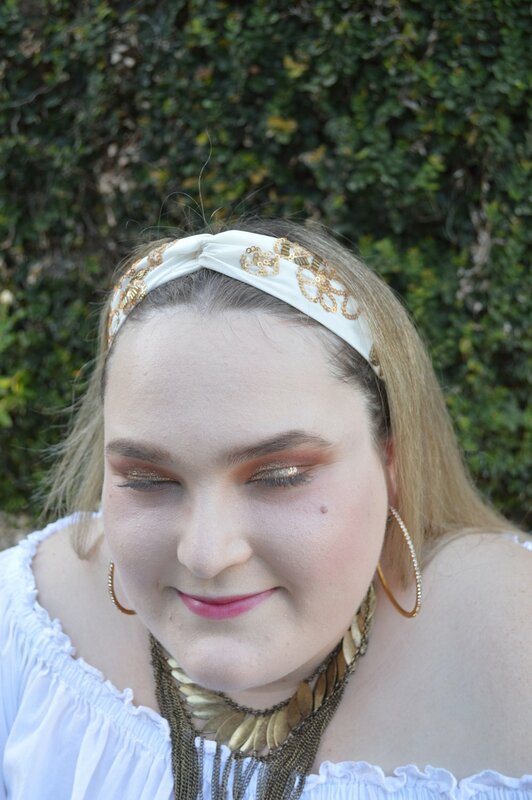 I tied my hair back with a beaded headband, and finished of my glam look with a red, orange, maroon, and gold glitter eye look. Finish off the outfit with a simple leather sandal and you have a comfy and fabulous halloween costume. Click these links for; leather sandals and a headband, follow the links below for top and skirt recommendations. Taylor Swift’s REP tour this year has been a constant stream of costume content, between Taylor herself and all the looks that people wore to her concerts, it seemed like a no brainer to add a “Look what you Made me Do” look to the lineup this year. “New Taylor” is far more glamorous than ever before. But Snake Queen Taylor may be the most glamorous of them all. 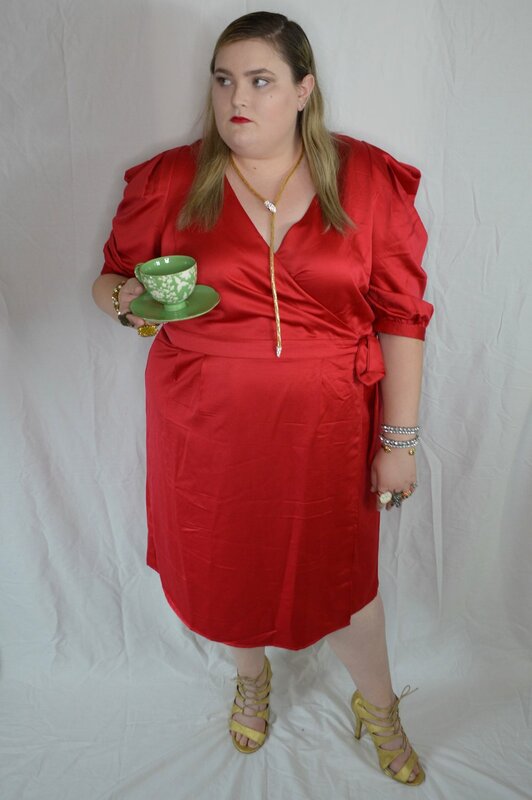 It’s a simple look to create, find a red wrap dress and accessorizing with as many rings and bracelets as you can find, a snake necklace, and some gold strappy shoes. Taylor’s glam for this look has her hair left with a natural wave and pinned back behind her ears but worn to the front, and then of course her signature bright red lip. To get a perfect red dress check out the links below and click these links to get dupes of her shoes and necklace. A special thank you to my very good friend Leah who did a fantastic job as my makeup artist for this blog post! Check out her Instagram for more make up inspiration. I had such a great time putting together all of these looks and can’t wait for you all to see what’s to come. If you recreate any of these looks please let me know. Leave me a comment down below telling me what Halloween movie I need to watch this weekend.